I read a quote the other day, and it talked about the need for alone time. The need to be by one’s self to refresh, digest and formulate opinions. In our society, we are constantly influenced by those around us, even when we think we aren’t. People’s opinions are constantly filling our heads through social media forms like, Facebook, Twitter and Instagram, also through news sources on television and in the news paper and then there’s also advertisements that are pushed in front of our faces all the time. Everywhere we look, people are trying to convince us to think, act, and be a certain way. 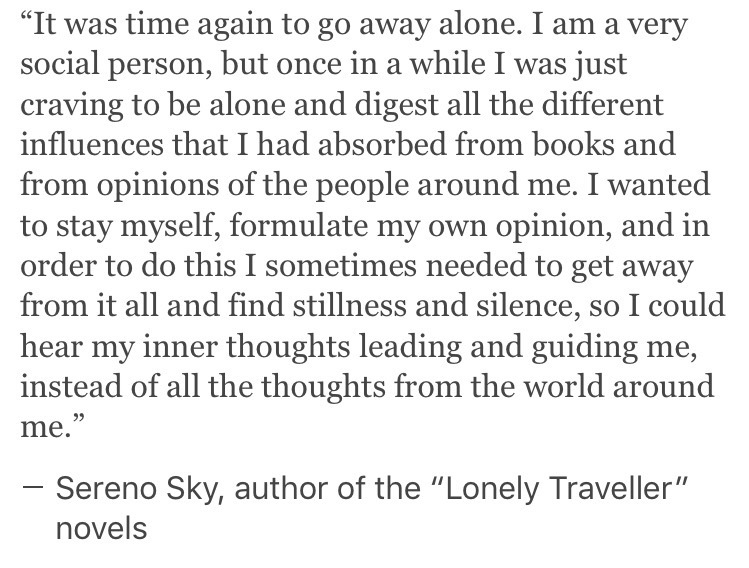 Now more than ever alone time crucial to build our own thoughts and opinions. In this society, do you think it’s possible to build our own opinions without being influenced by those around us? With our cellphones being glued to our hands and thoughts always being pushed into our heads, the thought of unbiased opinions sounds like a hard concept to grasp. I believe that in life there is never just one way to look at something, even though sometimes our society tries to convince us otherwise. I challenge each of you to form your own opinions on things. If something doesn’t seem right or correct to you, dare to think outside of the box. Sit in silence every once in a while. Let your thoughts form on their own. Decide if you agree or disagree with what is being taught and told to you. It’s people in this world that choose to create their own ideas. thoughts and opinions that make a difference. Remember though, to be open to all the opinions around you as well. If you are expecting people to be willing and open to your opinions, then you must treat their’s the same. I Switched to a Natural Deodorant and here’s what happened!